With these declarations, Patrick French establishes the platform for this wonderful and intensively researched book. 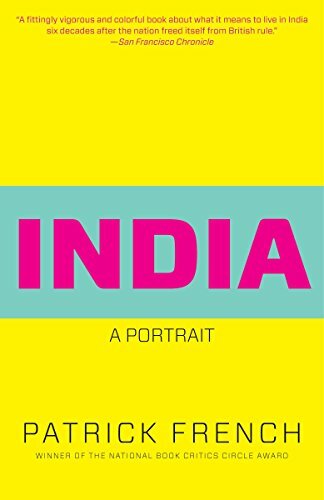 In India: A Portrait he delivers not only a portrait but also a biography of this complex and increasingly significant country. He has created a fascinating, thoroughly engaging exploration of India that is, at times, as complex and even contradictory as is its subject. Mr. French does reference published accounts, but he really tells his story of India through stories of a sample of individuals. He presents his discussion “through three different prisms:” political (Rashtra, or nation), economic (Lakshmi, or wealth), and social (Samaj, or society). In some cases, the stories seem almost arbitrarily assigned, as many of the tales could pass through any of these three filters and still aptly illustrate his message. Rashtra is a frank, irreverent, and thoroughly researched account of India’s political history. Mr. French is wonderfully blunt in his discussion of the patronage, corruption, and ever-present sycophants that pervade Indian politics. The topic is by no means new; French himself cites numerous secondary sources. He clearly is close to his subject, though, and he shares the understandings he has developed through research and personal experience. The reader gets the sense of having a personal window into the issues and events. Author French is appropriately selective of his source material, which includes several first-hand recollections of the early years of the nation and the events that preceded India’s independence in 1947. At times, though, the accuracy of his historical sketch would benefit from a bit more detail and context. For example, his relation of the events leading to Indira Gandhi’s assassination could lead the reader to believe it immediately followed Operation Blue Star, in which the Sikh Golden Temple was attacked. In fact, four months separated the two events. Mr. French’s evocative discussion of the partition of British India into India and Pakistan is fittingly harsh. He puts the point neatly: “The events of 1947 have an enduring capacity to shock.” To illustrate, he recounts a horrific, scarcely believable tale of fear, disproportionate pride, and death tearfully told to him by Bir Bahadur Singh, who endured the atrocities of that event. In Lakshmi, Mr. French recounts the beginnings of India’s economy and the course of its development. He describes India’s disheartening and ongoing stark wealth disparities by juxtaposing the story of Venkatesh, who literally had been chained to his quarry work, with that of the pleasant Sunil, a self-made multibillionaire and one of the richest men in the world. This section and the one that follows are in many ways reminiscent of Aravind Adiga’s novel, The White Tiger. Both books present rapidly changing economic and social sides of India, simultaneously tethered to and pulling away from entrenched corruption and cultural tradition, while the country marches ahead on its unique path. Samaj begins with illustrations of some of the troubling elements of current Indian society, such as the story of the educated and enterprising Satish, who puts his commerce degree to use in the operation of an online prostitution business. Truly disturbing issues are also highlighted. In the chapter “4ever” French tells a heartbreaking story of shocking police corruption and disreputable conduct that causes undeserved pain to Rajesh and Anu Talwar. Mr. French gradually steers the narrative toward an amusing, lighthearted, even optimistic conclusion. In “Only in India” he recounts some rather odd “singular stories.” In another context these could be derided as belittling and inappropriate; however, by this point in the book Mr. French’s affinity to and fondness for India are evident, and he successfully cultivates a similar affection in the reader. At times, though, Mr. French’s tendency to interrupt himself with asides or multidirectional narrative structure is distracting. For instance, his account of the Talwars’ painful ordeal is genuinely and profoundly heart wrenching, but is also frustrating to read. Repetitious and sidetracked commentary takes the reader off the path of the compelling story. Throughout the book Mr. French describes the complexities and singularities of his subject, its history, and its population. It is odd, then, that he frames some of his assertions in generalities that serve to reinforce existing stereotypes or assumptions. For example, in a discussion of group identities in the ethnically diverse India, he mentions “the fact that, until recently, marriage outside your community was difficult and unusual.” This statement is unhelpful and not a “fact” at all without greater precision in the meanings of “recently” and “community.” The assertion also seems to contradict what is written in a later chapter about genetic evidence of inter-ethnic mixing eons ago. Recounting the government’s tumultuous history with Sikhs and the actions of Sikh extremists, Mr. French notes “some Sikhs do drink alcohol” and relates a funny anecdote illustrating this. To be sure, alcohol consumption is culturally very common among Sikhs (with the exception of baptized Sikhs), whether clean-shaven or turbaned. In another instance, he refers to “the instinctive Indian dislike of dictators” and “the tendency to believe in several possible solutions rather than a single answer,” without elaboration of either proposition. Mr. French carries out those discussions convincingly, creating an appealing and inimitable portrait written with a bold, unique, and engaging voice.